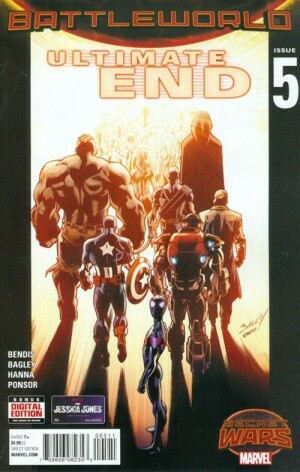 Secret Wars Declassified Week 30: Ultimate End #5 by Brian Michael Bendis, Mark Bagley, Scott Hanna, Justin Ponsor. It’s the second last week of the year (with the appearance of this column). After a four-month wait, the cap on the Ultimate Universe makes its way into my hands. 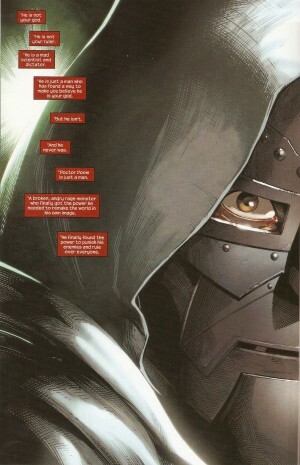 Ideally, this would have been out just before SECRET WARS #9 but dreaming, hoping, and wishing didn’t make that happen. At least we’re treated to an extra dozen pages. Some reviews have not been so favourable. Read on to see how I feel. 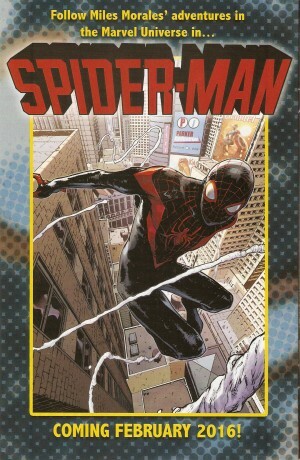 The most significant thing is that this is all about Miles Morales. Oops! Did I say that out loud?? Given that this column is mostly a synopsis of each series, I don’t go into every single detail. I’m making the exception with this last offering. I feel a great urge to extrapolate. Miles storms in, webs shooting everywhere, to get everyone’s attention. The clash between the 616-ers and the 1610-ers is inconsequential in comparison to his enlightenment. 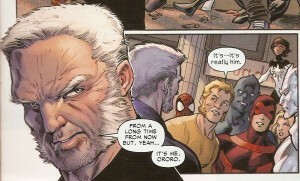 Speaking of light, humour ensues when Cloak blurts out Miles’ first name. So much for secrecy! 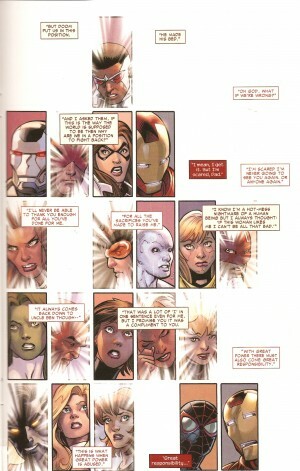 The two Jean Greys take a peek inside his head. Disturbing news! Emma Frost mind-probes him to access what both universes must know. Fires were forged differently in each of the respective realities. Nevertheless, history was made. All of that faces imminent extinction due to a poser who foolishly mismanaged his might: the false god Doom. There are many chinks in his armour. He is not infallible. He is one man that can easily be overthrown by the masses. 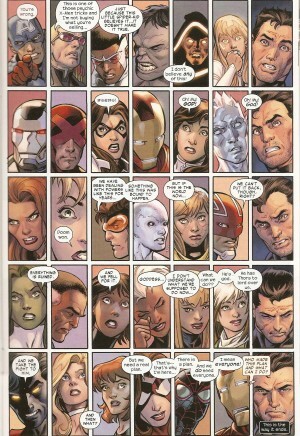 Bagley does Brady Bunch, Marvel style!! Seriously…I now see why this issue had its delays. That’s not a fair speculation. Mr. Bagley was always quick and extremely efficient. Too many faces to shake a stick at! The majority have something to say or think. Eventually, the collapse comes ever so closer. The panels begin to disappear as do characters from each corner. Before I spoil the very end [pun intended! ], the offensive occurs on an epic scale. There are two noteworthy moments: the disbelief and relief expressed by the X-Men upon spotting Old Man Logan as well as Ultimate Punisher ending his mission by blasting the Thor Corps. The latter was a fake-out from issue one. Frank may not have any heroic tendencies but it would be highly illogical to drop those that are. 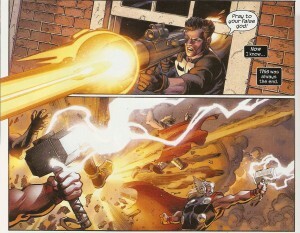 It makes perfect sense that his targets were the Thors. Peter and Miles leave voicemails for their most revered parental figures: Aunt May and Jefferson Davis. After the extensive epistles, the remaining heroes storm Castle Doom. 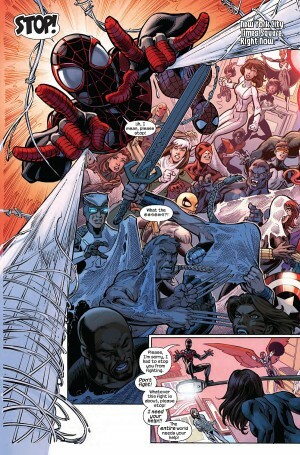 We don’t see the outcome of that since SECRET WARS #9 has yet to rear its head. There is one clear result: the focus stays on the two Spider-Men and the two Iron Men. After, two entire pages of nothing. No joke!!! Two whole white pages. It is at this point that some readers may have been irate. To be devil’s advocate, why pay an extra dollar for two blank spaces and only thirty pages of story even though the page count is thirty-two?? 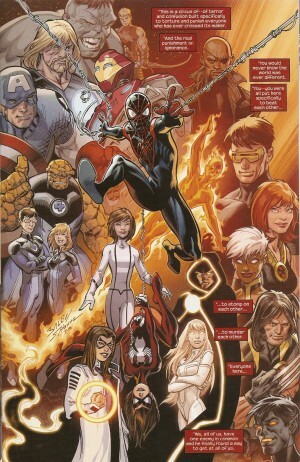 As I already stated, Brian Michael Bendis makes this final chapter Miles-centric. Mr. Morales has crossed over to the 616 with his memories intact. The unexpected but pleasant surprise he receives is the resurrection of his mother Rio Morales!!! She is alive, well, rejuvenated, and reimagined for ANADM!!! Questions pop up: does she know his secret ID? Will she learn it eventually? Miles is beyond euphoric. He got the sweetest deal of all. His friends Ganke and two others also made the trip unscathed. They definitely are privy to his secret. All is right in the world as Miles takes Manhattan!! The plug for his upcoming series is unabashedly in-your-face!! Criticisms fly wildly. 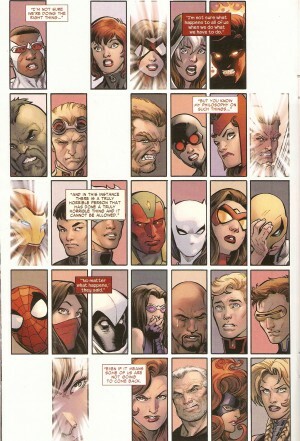 One may posit that Mr. Bendis’ gift for gap is prominent. I myself am not that cynical but it does make me think back to the early days at Marvel Comics when writers were paid for every single word. Why do you think Stan Lee’s stories were sagas in themselves?? Mr. Bendis is the caretaker that closes up shop. He turns one key to lock a door that forever becomes inaccessible. 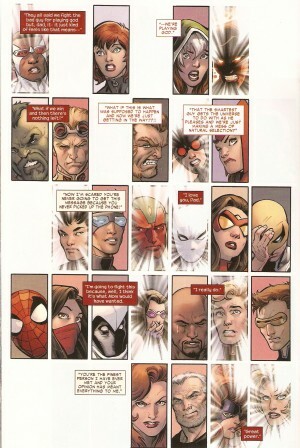 The decision to end the decade-and-a-half Ultimate Universe was made by the higher-ups. There’s no point decrying it. There are gaps to the pacing of the story. Since there are an enormous amount of individuals, it is unrealistic to fulfill their potentials. Peter’s involvement is minimal. He is there because he’s the flagship character of the MU (IMO) and Mr. Bendis chronicled his adventures for a dozen years. The metaphor is painfully apparent – the old guard makes way for the newer blood. 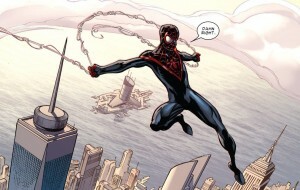 It matters little that the 616 will have more than one Spider-Man swinging around NYC. Miles Morales is an endearing and immensely popular character. His overall contribution to this tale was lacking. I attribute that to his youth and continuing learning curve. I applaud Mr. Bagley for his output. 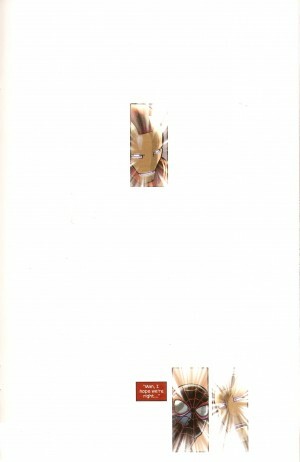 The pages are flashy, splashy, and downright dashy!! I’ve always appreciated his art. 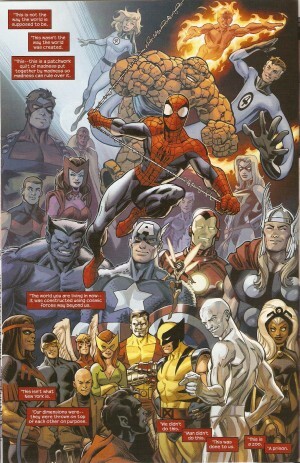 His style changed somewhat when he returned to Marvel four years ago but it seems like he has stuck with what works. 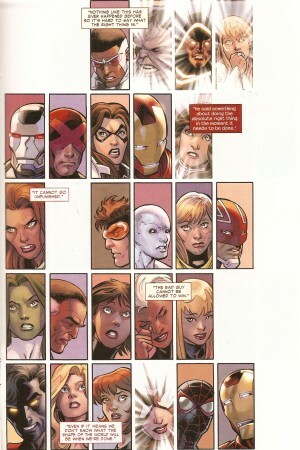 I’m overly impressed at the two-page spread containing 35 panels apiece. That’s 70 squares!!! Talk about labour intensive! He rightly honours the 616 and the 1610 in another two-page spread. 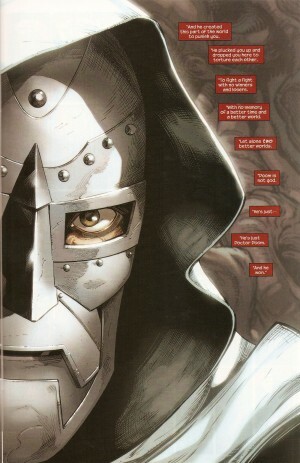 He also gives Doom a noble air when the megalomaniac gets his own mini-spotlight. I almost sympathize with the guy! 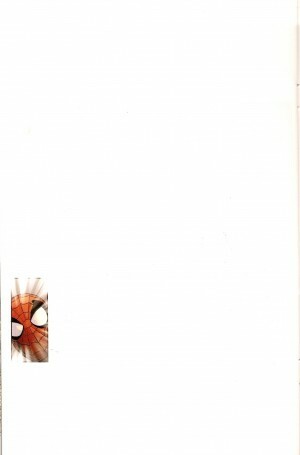 It is fitting that this be the penULTIMATE chapter in the entire Secret Wars yarn. It’s a bit presumptuous to assume what comes next but I’m sure issue nine will reveal in more detail the UU’s final fate. It should. That issue should be triple-sized for cover price! I digress. I’m a bit torn here. I will rate this issue twice. 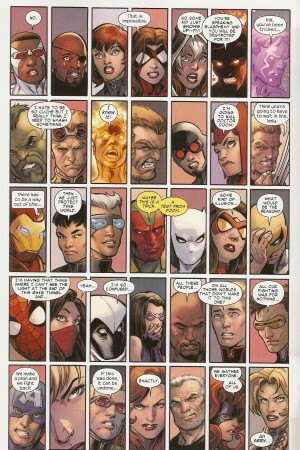 Unfortunately, I feel Mr. Bendis’ storytelling skills have severely slipped over the years. I wasn’t thrilled with how he handled AVENGERS and NEW AVENGERS. 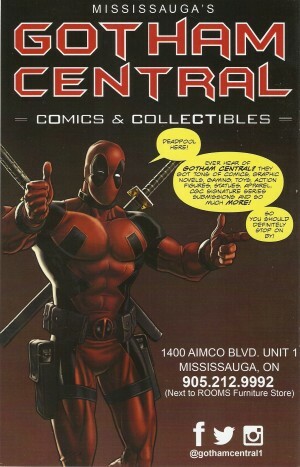 I haven’t read much of his ALL-NEW X-MEN and UNCANNY X-MEN but sources indicate they were X-cellent!! For this particular instance, I give the plot 3 out of 10. The art is of the highest caliber. It is irrelevant if you are a fan of Mark Bagley or not. The man impacted every single page, including those blanks ;-P I give his efforts 9.5 out of 10.